HOME > mario verdelli, nadia presenti: publications . 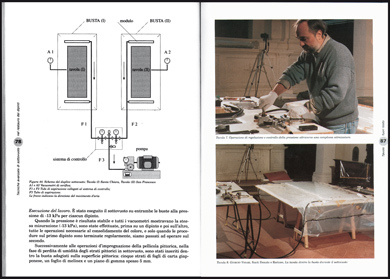 . .
M. Verdelli, N. Presenti, M. Goretti, Il controllo delle temperature nel restauro delle opere d’arte: metodiche ed innovazioni tecniche, KERMES, 25, 1996. In the restoration of oil paintings, the use of traditional heating irons remains indispensable for many activities, despite the recent advent of the hot table and vacuum techniques. However, the bimetallic thermostats of the heating irons presently in use produce large temperature differences (25-35 °C) which can lead to uneven results or even serious damage to the painting. Therefore, we developed a new automatic computerized control system for use with heating apparatuses. The control unit can be applied to tacking and heating irons, and assures the maintenance of the selected temperature while markedly reducing temperature fluctuations (± 2 °C maximum). The ability to apply a constant and programmable temperature to the painted surface throughout the treatment allows the restorer to operate with greater tranquillity. In addition, it permits lower working temperatures than with traditional heating irons, with consequent advantages when working with heat-sensitive surfaces and thermoplastic resins. The work was presented by Anna Maria Maetzke and is the first volume of the series: «Palazzo delle Statue » of the Superintendence for Architecture, Landscape, and Historical, Artistic and Ethno-anthropological Heritage, Province of Arezzo. To apply a transparent lining to paintings (when it is necessary to consolidate the canvas but maintain perfect vision of writing, signatures, dates and symbols on the reverse side), it is necessary to use a synthetic thermomelting adhesive like Beva film. To achieve certain results, the technical characteristics of the resin require precise temperatures and homogeneous application pressures. For correct adhesion of the synthetic lining to the canvas, we constructed a new apparatus for precise control of the vacuum pressure, so as to work effectively at a very low degree of vacuum. For heat application, instead of the hot table we used a new computerized control unit which is completely automatic, more precise, very easy to use and considerably more economical than the hot table. This technique (fully described in the article) allowed perfect application of the synthetic resin to two XVIII century paintings, leaving the autographic writing on the reverse of the canvases clearly visible. A. Aldrovandi, N. Presenti, M. Verdelli, Indagini termografiche e sottovuoti localizzati nella conservazione dei dipinti su tavola. Nuove ricerche e risultati. OPD Restauro,18, 2006. Journal of the Opificio delle Pietre Dure - Restoration Laboratories, Florence. An apparatus was designed to uniformly distribute consolidant beneath the paint films of panel paintings to repair decohesion and detachments. This apparatus allows localized vacuum consolidation directly at the restoration site without dismantling the art work. In the search for new restoration techniques we studied the dispersion of consolidants at atmospheric pressure and under vacuum using radiography (radio-opaque consolidants) combined with a thermographic technique based on differences in temperature between the consolidant and the surface of the painting. The thermographic technique allows real-time monitoring of the dispersion of the consolidant beneath the paint layers and of the entire consolidation process. 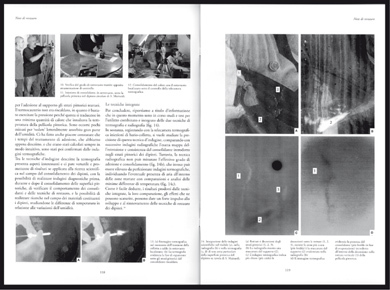 M. Verdelli, N. Presenti, M. Goretti, Tecniche avanzate di sottovuoto nel restauro dei dipinti, Edifir-Edizioni Firenze, Firenze, 2007. Second edition (updated and expanded), presented by Giangiacomo Martines. The volume was officially presented at the Restoration Exhibition (Salone del Restauro) of Ferrara, 2007 - speakers: Marco Ciatti, Giangiacomo Martines, Mario Verdelli, Nadia Presenti and Marco Goretti. Second edition (updated and expanded). The manual analyses vacuum techniques used in the restoration of paintings. A broad array of examples of analytical and intervention techniques is presented using original drawings and figures and a series of technical illustrations. In addition to technical and terminological clarifications, this second edition greatly expands the material provided to the reader with the introduction of two new Appendices, new illustrations and a useful Bibliography. In recent years, interest in the methods of conservation of paintings has grown not only among specialists but also among clients and people interested in the various techniques used in this field. This is the case of the vacuum technique applied to valuable works of art. This technique, which uses the atmospheric pressure for several applications, is very effective for the consolidation of paintings. However, few specialists are able to apply it correctly, mainly because of the lack of specific studies and the insufficient and fragmentary literature. 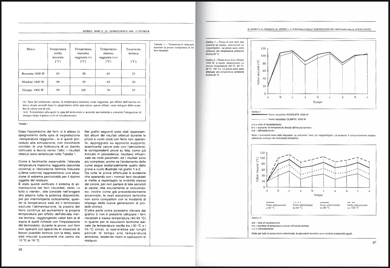 This publication provides the first complete analysis of the subject and can be used as a handbook for the correct practical application of the vacuum technique, particularly in the consolidation of panel paintings which requires special methodologies and suitable pressures. For this reason, we outline the theoretical and practical elements of the vacuum technique and the research on the effects of pressure on works of art. These studies highlight the difficulty of extracting the air around the painting in order to create a uniform vacuum. Such problems, well known by specialists, can be overcome by an innovative and proven solution that allows the restorer to use minimal homogeneous pressure with excellent results. The book includes an accurate description of the equipment employed, with tests of pressures and consolidation materials on model paintings carried out to investigate and improve the methodologies. Most of the data produced during the research and tests are published in this volume. The final part of the book includes a detailed description of practical applications for the restoration of valuable paintings, with a clear explanation of all the operations and results. In addition, new developments of the vacuum technique are envisaged and extensive photographic documentation is included. Modern techniques for the transparent re-lining of paintings. Authors: L. Speranza, M. Verdelli, N. Presenti. Complete version, with new unpublished images. BEVA FILM, RE-LINING WITH VACUUM, HOT TABLE REPLACEMENT, COMPUTERIZED EQUIPMENT, MOUNTING OF THE PAINTING ON THE FRAME. Thermographic and Radiographic Studies of Vacuum Consolidation of the Paint Layers of Panel Paintings. PANEL PAINTINGS, VACUUM CONSOLIDATION TECHNIQUES, BARIUM SULFATE-GLUE CONSOLIDANT, RADIOGRAPHY, THERMOGRAPHY, COMPARATIVE ANALYSES. Unicum - Revista num. 10 //Maig 2011 de l’Escola Superior de Conservacio i Restauracio de Béns Culturale de Catalunya, Barcellona, 2011. The web edition has been thoroughly revised by Mario Verdelli and is entirely drawn from the book of the same name published by Edifir in 2007. It has been divided into four sections and three pdf files to be more conveniently consulted and downloaded. Our book is recommended by Turin University and Venice University, which is why we have decided to make it available to professors and students in the field.